Medical Guardian is the fastest growing medical alert system provider in the U.S. and tops InHomeSafetyGuide’s list of best Medical Alert System’s for the 3rd consecutive year with an overall score of 9.9. BBB A+ rated UL-Certified equipment, CSAA Five Diamond Certified Monitoring Centers, and a dedicated team of Customer Care representatives available 24/7/365, Medical Guardian provides their commitment to the customer every day. Medical Guardian has the widest selection of systems of any provider at prices that fit any budget. Medical Guardian’s Full Video Review – 3 min. Shopping Experience is one of our 4 ranking criteria and our secret shoppers were unanimous in their praise of Medical Guardian. 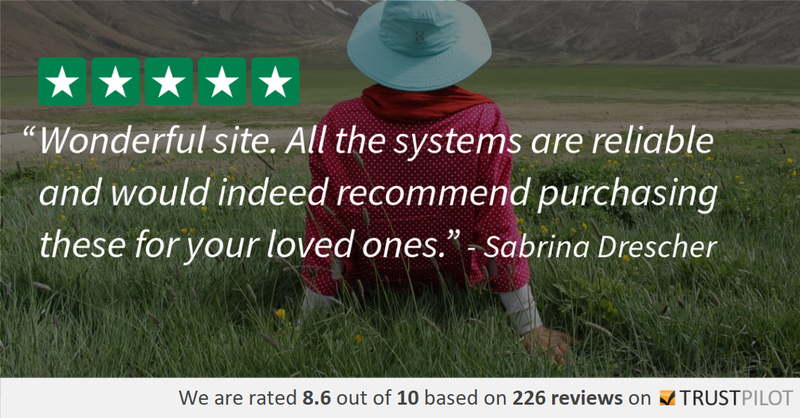 Common descriptors used by our shoppers were “highly knowledgeable”, “low-pressure”, and “extremely helpful.” In our Secret Shopping scenarios, we describe multiple situations and rank according to the customer care professional’s ability to map a system to our needs. This is one of the two categories where a new benchmark was set – a perfect 5/5 in each call. 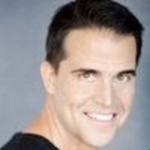 They make practical recommendations directly tied to the individual’s particular needs. 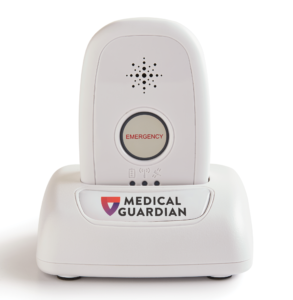 Medical Guardian’s website offers easy-to-understand language when describing the features and benefits of their various Medical Alert System solutions. If you’re not sure of which options to choose, Medical Guardian has a handy free Risk Assessment online tool to help. It walks you through a series of basic questions that takes about 2 minutes and then makes recommendations based on your answers. We highly recommend using this tool. If you’d rather speak with a live person, Medical Guardian has specially trained Life Safety Consultants standing by to help customize a plan that caters to your specific needs. As for cellular network coverage, Medical Guardian’s cellular and mobile alert systems use the powerful AT&T network cellular connectivity. AT&T’s cellular network is FREE (you do not need to sign up with a separate AT&T service plan), but if you live in a rural area, you can confirm your neighborhood is covered. For Medical Guardian, functionality comes first. They want you to get immediate access to trained experts whenever you need help. To do that, they have engineered all their emergency buttons to be easily visible. You won’t have to fumble around looking for the right button to push. Active Guardian– Most impressive Medical Alert System we have tested. 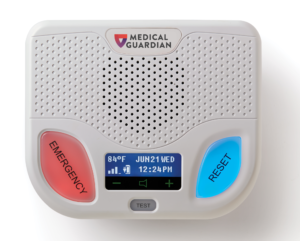 Medical Guardian’s newest system, Active Guardian, boasts the most advanced technology found in a medical alert system to date. The device functions the same as their Mobile Guardian system, except it also includes fall detection, 5-day battery life, Wi-Fi capability, and offers a more sleek and modern look. All their systems are simple to set up and operate: plugin, make a test call, and go. In today’s world of complicated technology, we found this refreshing. While functionality is the most important part of any medical alert system, having attractive equipment is important as well. The more attractive the equipment, the more likely you or a loved one is going to place it in an easy-to-access area of the home or take it with you. 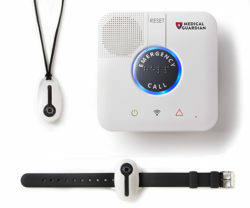 Medical Guardian is keenly aware of this as evidenced by the simple and elegant design of their base units and wearables (pendant or wristband). Their On-The-Go systems are light, yet durable. Their pendants and wristbands are sporty and youthful. Medical Guardian incorporates fall detection capabilities in an approach we applaud. Instead of offering a specific system for fall detection, Medical Guardian offers it as an option for almost every system. This provides much more flexibility to the user when choosing a system and is also something that can be added on later with a simple phone call, as opposed to swapping out systems. NEW! Freedom Guardian – Wearable Medical Alert Watch. It’s a revolutionary approach to medical alert systems. Freedom Guardian gives older adults the protection they need and tools to age healthily. And it’s done discreetly and with style! Aside from the core feature where you can easily press a single red button on the smartwatch to quickly speak with an emergency operator to get the help you need (via two-way communication) at your exact location (via built-in GPS technology), it can also notify the wearer of calendar alerts & reminders to help manage day-to-day tasks. Plus, one can conveniently stay up to date on the 3-day localized weather forecast. 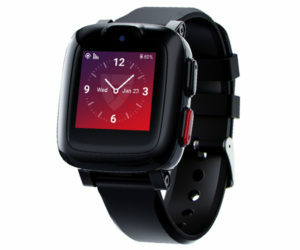 The smartwatch also includes text-to-speech messaging, so a watch user can easily receive and respond to SMS messaging from their loved ones without the need for a keyboard. Note, you do not need an additional smartphone nearby to connect and speak with an emergency operator. As for pricing, the device costs $99 and there’s a monthly service charge of $44.95. The optional add-on for the messaging & reminders service is $5/mo. Even if one chooses to stop using the service in the future, they can keep the device as a standard watch. Overall, the Freedom Guardian was designed to empower older Americans to continue to live the lives they love, for as long as they can while maintaining an independent and active lifestyle. Learn more and get exclusive savings by calling 800-225-3002 or by visiting Medical Guardian’s official Freedom Guardian web page. 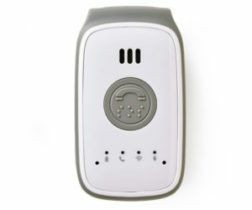 Medical Guardian is determined to provide an affordable medical alert system for your needs. They’re passionate about keeping you safe in your own home. Today, when it comes to real value, nothing can beat customer care call centers that are based here in the United States. Medical Guardian does that. That’s real value. When we get older, our hearing can go sideways. It’s nice to be able to talk to someone who can easily understand us, and who we can easily understand. With Medical Guardian, if there’s an emergency, there will be immediate help on the other end of the line – 24 hours a day, 7 days a week, 365 days a year. They have committed CSAA Five Diamond Certified emergency operators. They’re widely respected and have an A+ rating with the Better Business Bureau. They have been endorsed by the Underwriters’ Laboratory, The Monitoring Association, Factory Mutual, and the U.S. Department of Defense, among others. Nationwide, Medical Guardian is the #1 top-ranked medical alert provider and offers the most complete medical alert system on the market. Our wish list – we would love to get both the pendant and wristband as standard equipment. Our final thoughts – a company has to have a lot of good things going for it in order to make it to the top of any BEST list. Medical Guardian has it all.